Midsize Company was in the early stage of hiring its first head of Human Resources. CEO identifed four skills as most important to the Company and this role. After posting on regular job boards, company received 72 applications from candidates. Each candidate was asked to take the soft skills assessment. Within a week, Company had 30 candidates pre-screened for critical soft skills; most with references via 360° feedback. In 5 minutes, software helped identify the most "high potential" candidates. Company interviewed 5 candidates and hired new head of HR in 2 months instead 6 months they anticipicated. Company s​​​aved over 20 hours of screening, reference checking and consultant's time. Created a blended view of their Talent. 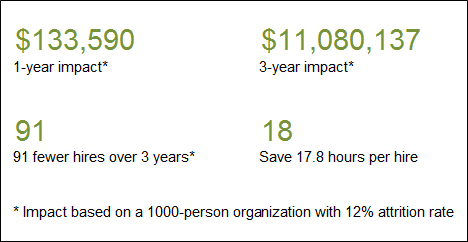 Use this interactive calculator to estimate your ROI on soft skills. You can edit assumptions and get impact analysis in real time.